If you’re looking to maximize the aesthetic of your backyard, there is almost no better choice than installing a new pond. However, because ponds come in such a wide variety, it can be difficult to know what type of pond is right for you. Fortunately, with the right information at your disposal, you won’t have to miss out on one of the best backyard design choices that there is. When you take everything into consideration, and get advice from pond installation experts, you’ll be able to pick a backyard pond that both meets your needs and adds an attractive design touch to your Atlanta backyard. 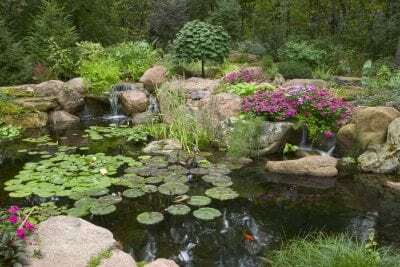 Here are a few tips for choosing the right style for your backyard pond and find out how you can begin your pond installation project. Possibly the biggest factor that you need to consider when you want to install a pond in your backyard is how much space you’ll be working with. Although larger ponds certainly have the stronger points, they are not suitable for every home, and can come with much higher maintenance requirements than many homeowners are prepared for. Take a look at your backyard and decide how much of it you are willing to dedicate to your pond. Also, take into account any existing features that your yard possesses and try to determine whether they will fit with your plans for your new pond. Understanding the maximum pond size you can accommodate will be tremendously useful in designing your water feature. Once you know what size pond you want installed, you will now need to decide where in your backyard is the right point for installation. In terms of appearance, you want your pond to be installed in an area that is easily visible inside and outside of your home. However, visibility isn’t the only factor that you need to consider when it comes to installation. For example, depending on the features of your pond, you will need easy access to both a water and electricity source. In addition, you’ll want to pick an installation point that gets the right amount of daily sunlight. Deciding on your installation location will go a long way towards helping you pick the style of your pond. Perhaps the most vital step in choosing the style of your backyard pond will be deciding exactly what you want out of your pond. Do you want your pond to be a fully contained eco-system, with both plants and fish? If so, you will need to design your pond to handle this option. If you’re planning on equipping your pond with additional features, such as a waterfall, this can also influence the overall styling of your pool. Have a brainstorming session and try to determine what your goal is in installing a backyard pool, which will help with styling. As you can see, there are several different factors to styling your pond. However, no matter what style of pond you choose, you’ll be optimizing the appearance of your Atlanta backyard with minimal effort. If you’re interested in installing a backyard pond, then your first step should be to consult with the professionals you’ll find at Universal Aquatics. At Universal Aquatics, we believe that every home deserves an excellent water feature, and we can help you pick out the right choice for your yard. Contact us today to talk about our services and what style of pond will best fit in your backyard.